The terrorist attacks of September 11, 2001 will be forever etched into the memory of all Americans. It was a day of tragedy, hate, loss, and outrage. It was also a day that propelled the United States into a war with an unconventional enemy. The outrage and anger that Americans felt that day fueled a desire to win the war so that events such as 9-11 never again happened on American soil. In their new book, “The Fight of Our Lives; Knowing the Enemy, Speaking the Truth, and Choosing to Win the War Against Radical Islam”, William Bennett and Seth Liebsohn suggest that America’s desire and resolve to win the war on terror is waning. Bennett and Liebsohn have written this book to wake Americans up to the fact that we are still at war and that radical Islam is the enemy. Through detailed research, interviews, quotes from politicians, military leaders, and Islamic leaders on both sides, the authors chronicle more than ten years of terrorist attacks against the United States and its allies; including the shooting at Ft Hood, embassy bombings, the attack on the USS Cole, and many other that we see daily in the news. Bennett and Liebsohn cite, time and time again, the connection between the Islam and those perpetrating the attacks. 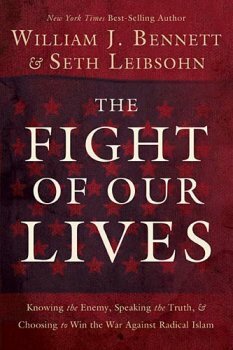 “The Fight of our Lives” also demonstrates how US policy has shifted since 9-11. Beginning there, the leadership of our nation used the words “terrorism”, “terrorist”, and “war” openly and took a firm stance against those harbored terrorists. The authors suggest that through years of tolerance, appeasement, and political correctness, we hardly hear these words anymore. The authors write to remind Americans that terrorism has not went away. This book is hard-hitting and to the point. It is very “in your face” about the issues of terrorism and Islam. You may not agree with every point the authors make. You will however be challenged to evaluate the facts and decide for yourself whether or not Islam is the real enemy of the United States.